Here’s a great idea for an iPad accessory – just kidding: it’s terrible! No, just kidding again. The idea is sound, but the implementation doesn’t really get past the lazy-computer-render stage. 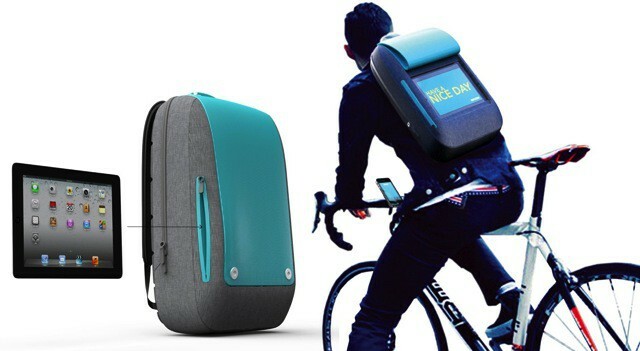 It’s called the iBackPack (really) and it’s a way for cyclists to communicate with people behind them. As a city-dwelling cyclist, I have regular contact with cars (although thankfully not regular physical contact). Unlike the rather polite cyclist in these product mockups, though, I have my own blunt and effective ways to communicate with drivers. The first is called “The Finger,” and I raise it in response to pretty much any complaint from a car driver. Yes, sometimes I’m in the wrong, but keeping things simple also keeps things safe, as I just flip the bird without even having to think. The second is “The Lugey,” which is my default protest against cars which block the bike lane, or swing in front of me just yards before a red light, or who try to right hook me. The Lugey is best delivered in winter when phlegm and saliva are more plentiful and The Lugey is more easily “hocked,” but in summer it dries faster and is therefore harder to remove. Either way, I recommend targeting a side window that has to be washed by hand. The iBackPack, by contrast, is a place of serene politeness. You slide your iPad into the rear receptacle and use it to show messages to motorists behind you. Messages are composed on an iPhone mounted on the handlebar and beamed wirelessly, presumably using a companion app. The main problems I see are that it exposes the relatively delicate screen of your iPad, that you won’t be able to read it in sunlight, and that you will run your batteries down pretty fast as you’ll be forced to leave the screen lit the whole time (apps can’t auto-unlock your device). Still, the idea is interesting. I wonder if I could hack it to display a photograph of my middle finger?